The epic adventure of a new kind of hero! 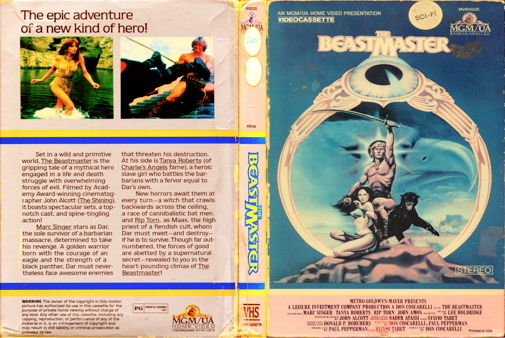 The Beastmaster tells the story of Dar (Marc Singer), the son of a king who was stolen from his mother's womb by a witch under the command of vicious sorcerer Maax (Rip Torn). A poor villager saves Dar from being sacrificed and raises him as his own son, teaching Dar how to fight and witnessing the boy's ability to telepathically communicate with animals. Their happiness is destroyed when their village is attacked by the evil Jun horde, a race of beast-like warriors controlled by Maax. Dar vows revenge and journeys to his father's former kingdom to destroy Maax. Along the way, he falls in love with gorgeous slave girl Kiri (Tanya Roberts) and teams up with former royal guard Seth (John Amos). Dar also uses his powers to enlist the aid of an eagle, a panther and two adorable ferrets named Kodo and Podo. Set in a wild and primitive world, The Beastmaster is the gripping tale of a mythical hero engaged ina life and death struggle with overwhelming forces of evil. Filmed by Academy Award-winning cinematographer John Alcott (The Shining), it boasts spectacular sets, a top-notch cast, and spine-tingling action! Marc Singer stars as Dar, the sole survivor of a barbarian massacre, determined to take his revenge. A golden warrior born with the courage of an eagle and the strength of a black panther, Dar must nevertheless face awesome enemies that threaten his destruction. At his side is Tanya Roberts (of Charlie’s Angels fame), a heroic slave girl who battles the barbarians with a fervor equal to Dar’s own. New horrors await them at every turn—a witch that crawls backwards across the ceiling, a race of cannibalistic bat men, and Rip Torn, as Maax, the high priest of a fiendish cult, whom Dar must meet—and destroy—if he is to survive. Though far outnumbered, the forces of good are abetted by a supernatural secret—revealed to you in the heart-pounding climax of! The Beastmaster!